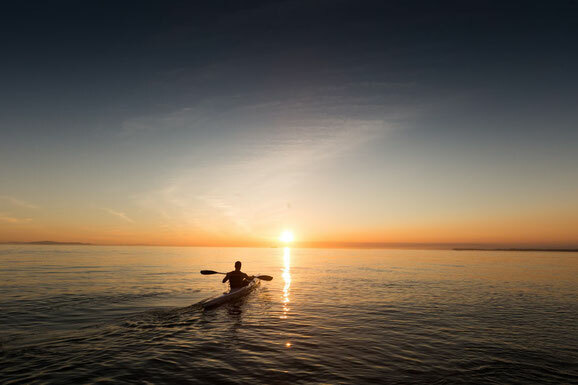 Sea kayaking is a great way to explore the coast, they are reasonable fast and stable so we can venture off on a journey that suits you and the weather. There is plenty of space in these boats to bring water, food or other essentials along. We'll paddle along taking in the wildlife and the scenery whilst having a chat. We will most likely start at a sheltered beach or pier where you will be introduced to your boat and paddle and before you know we'll be paddling off on a scenic adventure. Sea kayaks are seaworthy boats used around the world for marine sea journeys and they can be great for lakes too. Journeys varying from a few hours to many weeks, as they can accommodate a person with room for camping gear, food, water, and other supplies. They have sealed hatches for the equipment so it makes them pretty difficult to sink and you can have the addition of a spray deck that will prevent water from splashing into the seated area.